Having trouble planning and tracking your Construction Timeline project? Suffering from poor collaboration between your team mates? Our templates might be just the thing you are looking for to put some life into your excel document and minimize the hassle that is a part of collaborative work. Keep track of your Project Outline , dates, deadlines, objectives etc and plan accordingly using these professional set of free templates which are printable as well. Customize your excel and word doc presentations to suit your style and set things straight and avoid the chaos. Check out the samples and download them here. 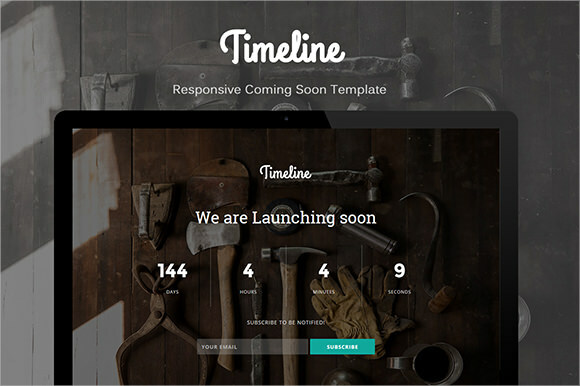 This sample of construction timeline template is ideally suited for promoting construction business on various social networking platforms. 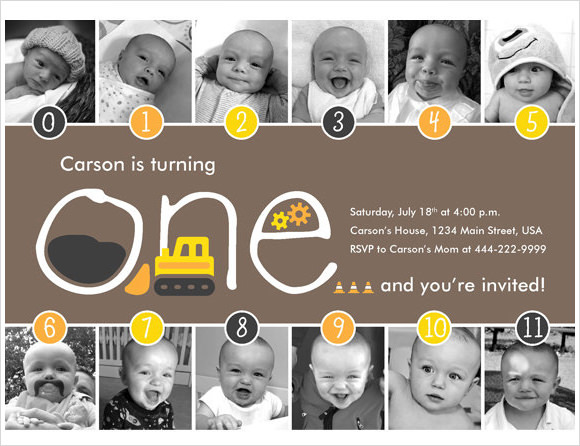 This template is fully layered and comes with two PSD file. This template sports RGB color and a clean design, along with highly organized layers. This template can be used for promoting a builder, for business marketing and for the construction of an FB page. This sample of construction schedule template is a simple template, which contains the name of the company in the header section. This sample is meant for the construction of an electric reliability project. The opening lines of the template specify the time span, followed by the disclaimer that exact deadlines are subject to unforeseen circumstantial hazards. The template then gives a brief overview of the work in different township, where they are expected to work. 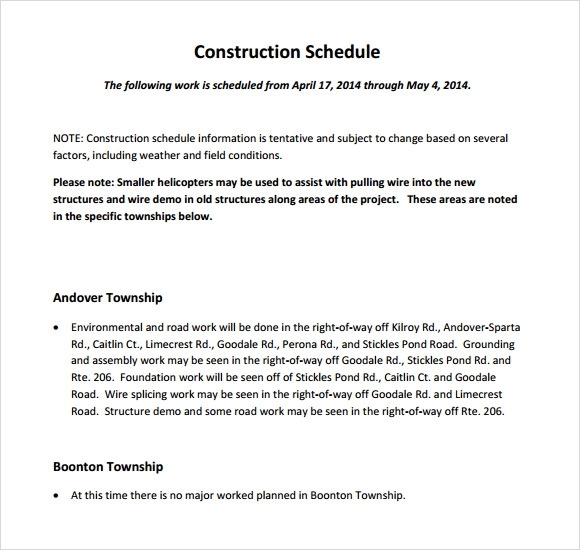 This sample of construction project timeline is a basic and simple template; with no pictures is artistic layout. This template works by dividing the project in three different sections followed by a brief description of every phase and some basic details of the work which needs to be done in each of those three phases. What Is A Construction Timeline? Construction timeline is typically described as the time period in which the construction work of a house or a commercial establishment should be completed; this timeline varies depending upon a lot of factors like availability of funds, raw materials, labor and so on. A construction Sample Timeline Templates is important to ensure that the work gets completed right on time without any unwanted delay. What Are The Various Phases Of Construction Timeline? 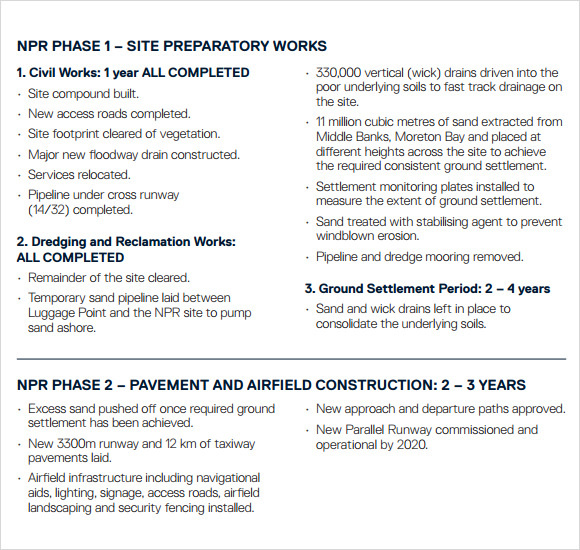 A construction timeline can be divided into several phases. Only when all the phases are complete, a building can be deemed complete. The various phases includes, preparing a plan and getting all the required permit, laying the foundation, building the frame and roof of the building, completing the plumbing and wiring work and finally finishing the interiors of the house including wood work and painting. What Is Process Of Drafting A Commercial Construction Timeline? A commercial construction timeline is more complex and different from a normal domestic work. Commercial construction requires a lot of pre-planning and consultation, since the projects are usually large and requires a lot of investment. The main phases of creating a commercial construction timeline includes. 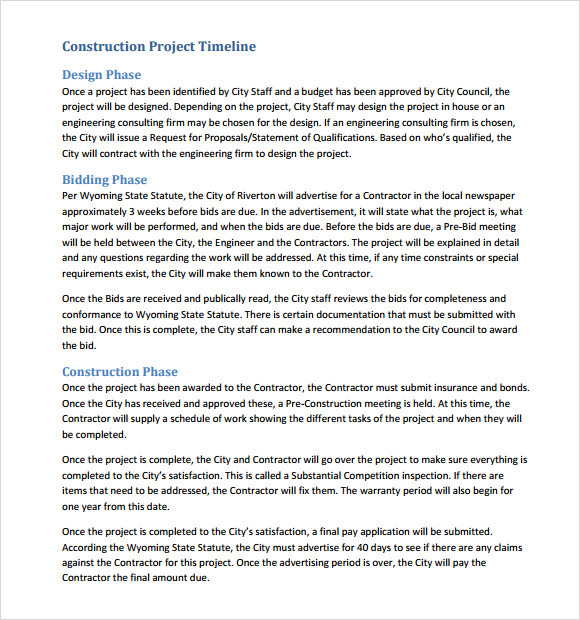 A construction timeline template is vital for any construction company, who want s to bid for a big project. If you wish to create your own brochure without any professional help, our samples would assist you with new ideas and designs which would surely help your plan to stand out in the crowd.